I arrived home in Chicago around 1am Saturday morning on a slightly delayed flight direct from San Francisco. What a week – I’m only now getting back into my normal routine! Brain worked overtime last week! Haha… ok… so I think that I’m finally caught up on sleep now that it’s Thursday. But it was a busy week! OpenWorld was worth the plane ticket, for both learning and networking opportunities. My two favorite sessions were at oracle closed world and the unconference, respectively… but there were plenty of great “official” openworld sessions too! It was great to see lots of old friends, to make some new friends and to meet people who I’d only known online. In particular, I ran into Martin Nash, George Woods, Karl Arao and Gwen Shapira quite a few times. Definitely looking forward to seeing everyone again soon! Oracle decided to hand out plenty of “blogger” passes this year and lots of people have already written excellent day-by-day summaries of OpenWorld. If you’ve read quite a bit about OpenWorld already then I’m not offended if you just skip the rest of this article. For future OpenWorld attendees, I’d stress one point: “who” is more important than “what”. Same philosophy I used to have for college classes. A moderately interesting subject from a good speaker is a lot better than a good subject from a poor speaker. Sure, hit a few important-sounding topics. But mainly you should find the smart guys and follow them around! MySQL – Keynote, High Availability, Idiosyncrasies That Bite: Everyone sitting near me at the keynote was an Oracle DBA who wanted to learn more about MySQL. They sat us all down and told us that MySQL is great software. I liked the session on HA since I could compare it to RAC. And “Idiosyncracies” was also very relevant – showing the key differences between MySQL and Oracle RDBMS. 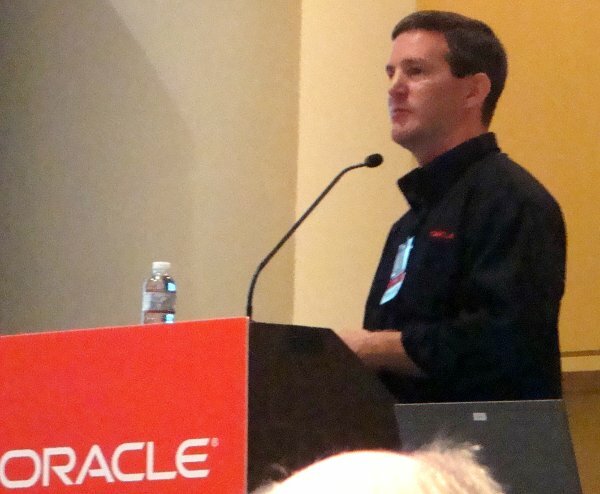 IOUG – SQL Server to 11g Cluster (Dylan Kucera), Oracle RAC Pack Panel: I’ve worked with Dylan before and he really knows a lot about migrating from SQL Server to Oracle. Nice to reconnect – and he’s definitely got his technical ducks in a row. He also has rare insight on navigating the soft (sometimes political) side of things. The RAC Pack are also fun to hear – these guys have loads of experience and inside knowledge on RAC. Larry’s first keynote: blah, blah, cloud, blah, amazon, salesforce, exalogic, blah, blah… exalogic? Lunch: Spent the morning hanging out with my non-technical friends who I stayed with for the week. Got to Moscone in time for lunch. Sat at a table with two bearded guys. Turns out they were not AIX sysadmins or linux hackers, they were database guys working for the government in Oman. Also, the other guy at the table was the CIO of some Israili organization. Small world. Closed World (Tanel Poder, Arup Nanda, Karl Arao, Me): Tanel, Arup and Karl were all quality. I always especially enjoy hearing Tanel – in fact just today I was telling someone on IRC about Tanel’s rlwrap bonus tips (remembering screen text and wordfile autocomplete). After everyone finished their presentations, I also jumped up to the microphone and gave a spontaneous 5-minute summary of my trick for running Oracle RAC on low-memory Linux. Hope I didn’t bore people too much. Good times! OTN Night, Thirsty Bear: After leaving Closed World, I ran into Karl near Moscone. We had dinner together with a few of his friends. After dinner we dropped by OTN Night – just as it was wrapping up – and we recruited Martin and George to hit the Thirsty Bear with us. Great way to close up the day! Closed World (Martin Nash, Kyle Hailey): Kyle is one of the guys who helped design Grid Control – and he has an excellent presentation on visual SQL tuning. He talked a bit about his new product at Embarcadero too, which looks pretty slick. Unfortunately I missed most of Martin’s presentation because I was getting introduced to Mogens Noorgard. It was also nice running into Mike Swing from TruTek again and we chatted a bit about what makes good educational/training courses. Unconference (Kevin Closson): This was one of the highlights of the week for me – just having a chance to throw any old question at Kevin. We chatted about memory hierarchies, chip architectures, blogging and more. It was a small group of people and the atmosphere was decidedly casual and conversational – a marked difference from most presentations (where larger groups don’t really allow this). OLTP and FC: Oracle Schedule Builder claims I was scanned as an attendee here. Interestingly, I don’t remember it at all. Heh. Unconference (Craig Shallahamer): I was familiar with Craig’s writing but I’d never heard him speak. The session was more like normal conference than unconference, but very good all the same. Craig strikes me as similar to Cary Millsap (indeed they worked very closely for many years) – but a bit more theoretical. His presentation feels a little heavier on the modeling and mathematics than Cary’s presentations usually are. Neil Greene: After spending quite awhile getting to know Craig, I trekked up to the Fairmont to meet Neil Greene from Predictive Technologies Inc. We’d been chatting in cyberspace quite a bit and I was eager to hang out in person. Had a great time learning about what he’s been up to with PTI. Blogger’s Meetup: After coffee with Neil, it was time for the long-awaited bloggers’ meetup! Pythian organized this party, where everyone got a tshirt and there was a contest to get the most signatures of other bloggers! I was a late arrival and didn’t win the contest, but I had a blast hanging out with lots of familiar faces! The Big Party: And who can forget Oracle’s big party? A festival in itself – lots of food, carnival games and amazing live music. (Black-Eyed Peas, Don Henley of the Eagles, Steve Miller Band, Montgomery Gentry, etc…) In reality, the party was fun but it was too big for me. The crowd was so huge that I only ran into three familiar faces. (Dylan, Neil, and a local friend who got a ticket.) Next year I might just skip it and get a group together for dinner or something. Oracle Linux (Todd Sheetz), Query Transformations (Joze Senegacnik), RAC Performance (Arup Nanda), Clouds (Alex Gorbachev): Funny. I attended more official OpenWorld sessions on Thursday than any other day. Todd is a great guy and I enjoyed his session on Linux. Joze, of course, is amazing. This session is a must-see. Arup draws a huge audience but I think that sometimes he has to pitch a little slower so everyone can keep up. (He went a lot more in-depth at Closed World.) And Alex did a great presentation on clouds – especially considering that Larry Ellison stole half of his slides for the OpenWorld keynote. So Alex spent Wednesday night re-writing this presentation. Small Party: And last but not least, there was the closing party. I managed to find Martin and Karl again, and the three of us hit the wrap-up party together. It was perfect. There’s nothing like kicking your feet up and listening to Bob Dylan and Bruce Springsteen when your brain is totally fried. OpenWorld officially ended with the wrap-up party, but my trip continued a little bit longer. Thursday night, Martin and I crashed a couchsurfer event for dinner. On the train Friday, I sat next to an Iranian guy from Iowa who also attended OpenWorld, then I had lunch with my father-in-law and then I had ice cream with another local friend. And in the airport I discovered that I was taking the same flight home as Steven Feuerstein! In conclusion, it was a busy but worthwhile trip. I’m glad to be home – with life getting back to a normal pace. But I’m looking forward to seeing everyone again. Next year at OpenWorld? Collaborate? UKOUG? I’m sure we’ll run into each other soon!